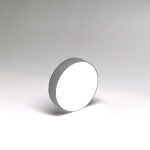 Base Lab Tools offers standard Ø1" & Ø1/2" mirrors with protected silver or gold coatings. Protective overcoating on both the silver & gold mirrors increase the lifetime. Protected gold provides >95% average reflectance from 650 to 1700 nm, and 98% average reflectance from 2 to 16 μm. 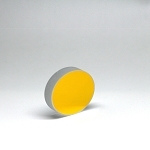 Protected silver has a higher reflectance than aluminum throughout the visible and near IR,and provides a minimal distortion for ultrafast lasers.